Write disk images to disks. The orginal program is loaded with LOAD"LOADCBMCMD",8 and started with RUN. 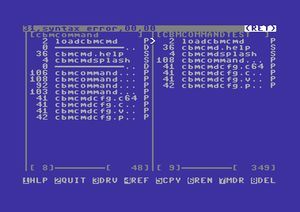 The CBM-Command starter detects the current computer system and loads the right main program. Generally, with CBM-Command the keys CRSR ⇑ ⇓ are used for scrolling through the directory in the active window or to select a file. The keys CRSR ⇔ to change the active window (left/right). The key SPACE is used to mark and select files. Selection will be used for batch operations as copying, renaming or deleting files. The 8 important program commands can be seen in the last row of the screen. In the first row of the screen shows the actual selected file with its filename and needed blocks. In the last row of the window you see the actual drive number (left) and the free blocks of a directory (right). You can use all keys for entering texts into an input window. Security queries or starting operation(s) will be started with the key RETURN or canceled with the keys RUN/STOP or ↑ (ESC ). A selected file (PRG and SEQ ) can be opened with the key combination SHIFT +RETURN in the built-in text viewer. @ - input a DOS-command, for example N:TEST,99 for formatting a disk. 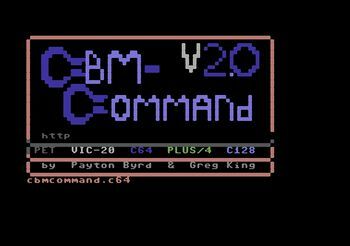 The CBM-Command Configuration Manager is loaded on a C64 with LOAD"CBMCMDCFG.C64",8. 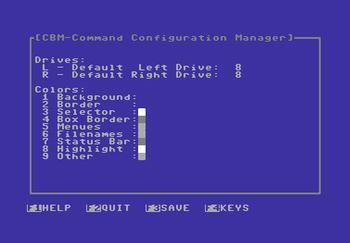 In the manager the user can change the colours (key 1 to 9 with a colour palette), the hotkeys and the standard disk drive (disk drive number; (key L left drive R right drive). The function keys cannot be modified ! The customize changes will be permanent after saving with the key F2 ! Select a command with the cursor keys and hit RETURN . A window appears and you see the current hotkey for this command in hexadecimal code and as sign. Press a new key or key combination (it will show under new) and hit the key RETURN . Commodore 128 - visually enhanced version with 80-column display and use the full clock frequency of 2 MHz for faster operations. This page was last modified on 12 April 2019, at 19:51.